Nicolas Correa Service, S.A. has installed and commissioned the fixed bed CORREA PRIMA 20 milling machine, once the machine had been fully inspected and retrofitted at the company´s facilities in Burgos. Versatility, precision and rigidity are the key characteristics of this family of CORREA PRISMA fixed bench milling machines, which were developed using state-of-the-art technologies and are designed for work requiring optimal finishes. 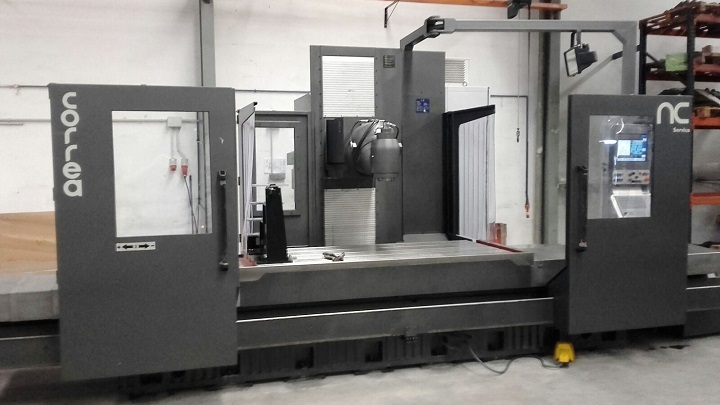 This CORREA PRISMA 20 second-hand milling machine, manufactured in 2007, features a travel of 2,000 mm on the X axis and 1,000 mm on the Y and Z axes. The standard equipment supplied with this milling machine includes a Heidenhain iTNC 530 numerical control, Ethernet card, Heidenhain HR-410 electronic wheel, digital servo motors and drivers, and slideways and guideways with automatic lubrication on the X axis, amongst other features. On the other hand, this milling machine offers the option of installing a UDG universal auto-indexing head with indexed positions of 2.5º at 3000 RPM. NC Service has completely retrofitted this milling machine, with the company´s customary professionalism and reliability. The machine was subsequently sold to the Valencia-based company CEBRIÁ, dedicated to the manufacture and marketing of a large range of accessories for fork-lift trucks. The state-of-the-art means of production in place at this company guarantee that the products manufactured comply with its quality standards and directives. Seeking to increase its production yet maintaining these same quality standards, CEBRÍA decided in favour of the efficient work of NC Service and elected to purchase this CORREA PRISMA second-hand milling machine. In addition to the thorough inspection of the milling machine, carried out by NC Service, this customer also requested the installation of a new, low pressure through-spindle coolant system, as well as a newly-manufactured 8-post static tool rack magazine. After all these options had been installed by NC SERVICE, the completed machine offered an even greater performance than the original version, thereby allowing the customer greater versatility in its production capacity. This is the second CORREA PRISMA milling machine in operation at this customer´s facilities, which is a sign that this customer is focussed on quality and good work.